other than London . . .
You can buy through tickets to Paris or Brussels from 130 UK towns & cities at www.eurostar.com. Option 1: Buy a Eurostar through ticket from over 100 UK towns & cities to Paris & Brussels. 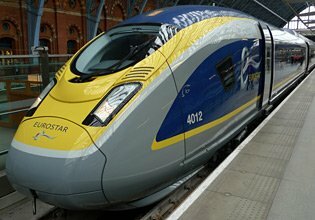 As long as you book 3 months or less before travel, you can buy a through ticket from most British cities and many larger towns to Paris, Lille, Brussels, Bruges or anywhere in Belgium using www.eurostar.com, making it affordable to reach Europe from the regions. This is usually the cheapest option as Eurostar have negotiated special cheap rates with the British train companies which are not available through normal channels. Option 2: Use Loco2.com to book through from any British station to most European destinations. Uniquely, Loco2 can book journeys to western Europe starting at any station in Britain, again assuming you book 3 months or less before departure. Give it a try! Their system combines tickets Eurostar & onward European tickets with one of the special fares from your local station to London International CIV described in option 3 below, although the add-on price for the UK journey is not usually as good as the add-on price used by Eurostar described in option 1. Option 3: Buy a separate train ticket to London International CIV. If you want to book your Eurostar more than 3 months ahead, this rules out options 1 & 2 as UK tickets can only be issued a maximum 3 months before departure. Or you may want to buy your European tickets from a source that cannot sell journeys starting north of London, such as a London to Germany sparpreis fare from German Railways at bahn.de or a London to Amsterdam ticket from Belgian Railways at b-europe.com. This also means you'll need to buy tickets for the UK part of your journey separately. For this purpose there is a well-kept secret: Special fares from most stations in Britain to a destination called London International (CIV), for use with onward Eurostar tickets. Read all about them here. They are usually a similar price to a regular off-peak ticket to London, but with more generous peak restrictions if you need to leave early on a Monday-Friday and with CIV protection for missed connections with Eurostar if your UK train runs late. On the downside, they're usually more expensive than the add-on rates used by Eurostar in option 1. Option 4: Board Eurostar at Ebbsfleet or Ashford if you live in Kent, East Sussex or South London. Option 6: Take a ferry from the West Country or South Coast to France then a train to Paris, by-passing London. Option 8: Belfast & Northern Ireland to Europe: Take a SailRail journey from Belfast to London, see the Northern Ireland page. You can buy a through ticket between over 100 UK towns & cities & cities and Paris, Lille or Brussels in either direction at www.eurostar.com. These special fares are only available at www.eurostar.com, not on any other ticket website or retailer. Note that You must have the United Kingdom version of their site selected (so that payment is taken in pounds) to book to or from these 100+ UK locations, wherever you happen to live. Major cities such as Edinburgh, Glasgow, Leeds, York, Manchester, Liverpool, Birmingham are all included, as are places like High Wycombe, Milton Keynes, Basingstoke & Reading. But smaller towns or villages won't be included in this through booking arrangement. TEMPORARY GLITCH IN 2019: There's a problem with www.eurostar.com at the moment which means UK place names aren't being recognised. Here's three possible workarounds (f these workarounds all fail, call Eurostar telesales and book by phone, they'll normally waive their phone booking fee). Do let me know how you get on with this! This page on the official Eurostar site still works with the UK stations: www.eurostar.com/uk-en/city-breaks/brussels/train/france/uk-en/city-breaks/brussels. Try it, but do let me know if it stops working. Alternatively, the Eurostar iPhone/iPad/Android app also still recognises the UK towns & cities. The internet can be a wonderful thing. This page was written by a fellow traveller to automate the manual workaround shown in the next section. All it does is compose the necessary URL for you: codepen.io/alex_penfold/live/zyyBzZ. 2. It'll come up as a Derby to Paris enquiry. Now edit this link in your browser address bar by replacing the four digits 1823 (which is the UK National Location Code for Derby) with the 4-digit NLC for the station you want. So if you wanted High Wycombe, High Wycombe's NLC is 3054, you'd change that first number from 7018230 to 7030540. Remember Eurostar through booking only works for 100+ key stations, not everywhere. 3. To find the NLC for any British station, go to www.brfares.com and run an enquiry from your chosen station to anywhere else, selecting expert mode. On the results page, scroll down past the cookie consent notice to where it says Flow origin, then there's the 4-digit NLC you want, then there's your chosen station name. Obviously, swap the two station codes so they're the other way round if booking one-way or round trip inwards towards London. 5. I've set up the link as a round trip. For a one-way, delete the 8&inbound-date=2019-03-20 bit. 6. I've set up the link as 1 adult. Change adult=1 to adult=2, adult=3 or adult=1&child=2, or adult=1&youth=2, etc. See the age limits on Eurostar's home page when you click on Adult. Infants under 4 don't need a ticket. It's usually the cheapest way... These through fares are generally cheaper than buying separate tickets, as Eurostar have negotiated special rates with the British train companies. The rates negotiated by Eurostar tend to be cheaper than even the special fares to London International described in option 3 below. You're legally covered for missed connections: Your whole journey will be covered by the international railway conditions of carriage, known as Convention Internationale pour le transport des Voyageurs or CIV. Amongst other things, this means that if your UK train is late and you miss a Eurostar through no fault of your own, you're legally entitled to be re-booked on the next available departure even if you ticket is theoretically non-changeable. A useful protection! However, I'm pleased to say that in most cases Eurostar generously extend this protection to anyone making a through journey, whatever type of UK train ticket they have. If you have a railcard, you can't use it on the UK part of a through ticket, although buying a through ticket may still save money. Booking opens only 3 months ahead for journeys with a UK domestic element, even though Eurostar itself opens for booking up to 6 months ahead. More than 3 months ahead and you'll have to decide whether to wait (and risk the Eurostar fare going up, which it will) or book the UK journey separately using option 3 below, at a higher price than you'd get as part of a through journey at www.eurostar.com. With 3½ months to go, I'd wait. But with 5 months to go, I'd lock in the Eurostar fare and buy the UK part separately using option 3 below. Going beyond Paris or Brussels? How do these Eurostar through tickets work? After booking, you get a print-at-home ticket for the Eurostar itself and a reservation code to collect the UK ticket from the self-service ticket machines at your UK starting station. For longer distance travel (for example, Manchester to Paris) they are only valid on the specific UK train which directly connects with your Eurostar, so if you want to stop off in London for any reason, you should buy separate tickets as shown in option 3 below. You can buy these through tickets in either direction, so for example you can buy a one-way or return ticket from Paris to York or from Brussels to Bath. But at www.eurostar.com you must select United Kingdom or change the site setting to UK English top right so that you make the booking in pounds sterling on the UK version of Eurostar's website. These 130 UK regional destinations do not show up on the French, Belgian, Dutch, US, or Rest of World versions of their site because UK train companies won't accept euros or dollars and Eurostar won't speculate by taking euros but settling in pounds. You'll have no problem booking on the United Kingdom version of Eurostar.com even if you live in France, Belgium or overseas. The booking system seems to work best from stations close to London that have 'walk up' tickets to London such as Reading, Milton Keynes or High Wycombe, where the system can simply add a fixed-price add-on to whatever the Eurostar price is, without the need to check seat availability. Stations further from London such as Leeds or Manchester require the system to check availability for the domestic leg to London, using a quota of advance tickets allocated specially for these European through journeys. Sometimes this quota isn't very big and gets used up, particularly from stations like Edinburgh or Glasgow where they don't seem to allocate many tickets in the first place. Instead of doing the sensible thing and automatically adding the price of a 'walk-up' always-available Off-Peak Edinburgh-London ticket to the Eurostar fare, the system simply says there are no trains which meet your requirements, when there certainly are. If this happens, just buy a London-Paris ticket and buy a separate ticket to London International CIV as explained in option 3 below. www.loco2.com is unique in that it can sell train tickets from any station in Britain to most western European destinations as a single transaction, with everything worked out for you. Give it a try! Loco2 does this by adding a special ticket from your UK station to London International CIV - the type of ticket described in option 3 below - to your European tickets from London to western European destinations booked through the French, German, Spanish or Italian ticketing systems. All your train times are worked out, with sufficient time to connect across London. These special fares ensure that international CIV conditions of carriage apply to the whole journey, meaning that if there's a delay you miss your booked Eurostar, you'll be rebooked on a later train at no charge - though in practice Eurostar usually extend this protection to anyone with any type of UK train ticket. Similarly, in the inbound direction you'll be rebooked on a later UK train if your Eurostar is late and you miss the connection. Booking opens 3 months in advance... Remember that you can only book through tickets from British stations 3 months or less before departure. Although Eurostar opens for booking as much as 6 months ahead, tickets for British journeys can only be issued a maximum of 3 months ahead. If you need to book further ahead than this, buy the UK leg separately as shown in option 3 below. Price-wise, the fares used by Loco2 for the UK leg are typically the same or better than a regular ticket to London. They often have more generous time restrictions so can be cheaper if you need to travel in the peak. However, the price of the add-on fares used by Loco2 is usually not as good as the extra-cheap UK add-on fares used by Eurostar in option 1 above, so it is likely that booking (let's say) from Bristol to Paris at eurostar.com then Paris to Zurich at www.loco2.com will be a bit cheaper than booking Bristol to Zurich at www.loco2.com. But using Loco2 saves having to co-ordinate two bookings on two sites, and if you're a newbie to international train travel, stick with www.loco2.com. And unlike Eurostar.com, Loco2 can apply a Railcard discount to the UK leg if you have a railcard. ...Buy a regular train ticket to London. ...at whatever the cheapest fare happens to be. You can check fares and buy online via www.nationalrail.co.uk or any train operator website with no added booking fees such as www.virgintrains.co.uk, or you can buy at the station. The 30-second guide to British train tickets on the UK travel page will help you understand the 3 different types of UK train ticket. Make sure you allow plenty of time to connect with Eurostar, allowing for the 30 minute Eurostar check-in and any delay to your UK train. From Scotland, you can combine the Caledonian Sleeper with a morning Eurostar to Paris or Brussels, see the Caledonian Sleeper page for details. From Cornwall, you can combine the Night Riviera sleeper with a morning Eurostar to Paris or Brussels, see the Night Riviera page for details. ...or buy a special ticket to London International CIV, a well-kept secret. There are special fares from most railway stations in Britain to a destination called London International CIV, for use with a Eurostar ticket or Dutch Flyer ticket to the Netherlands. They come in two versions, Advance (must be booked in advance, the price varies, it's only valid on the specific train you book) and Euro Open/Euro Saver (flexible, usually valid on any train that day, can be bought on the day of travel, price doesn't vary). Since 2010 tickets to London International no longer exist from every station in Britain, but they still exist from most stations and are well worth knowing about. Advantage 1: Fewer time restrictions! The flexible Euro Open/Saver fare to London International CIV generally has no time restrictions at all. In other words, you can hop on any train you like, even in the expensive Monday-Friday business peaks when normal Off-Peak fares are not valid, to connect with a Eurostar to Europe. This can be very useful. A handful of operators introduced time restrictions for these fares a few years ago, so please check, but you'll still find the time restrictions more generous than with normal Off-Peak fares. Advantage 2: You're covered by the International Conditions of Carriage (Convention Internationale pour le transport des Voyageurs or CIV), rather than the normal domestic National Rail Conditions of Carriage, for your whole journey. So if the British train is late and you miss your Eurostar, the CIV conditions of carriage oblige Eurostar to put you on the next available Eurostar without additional charge, even if your ticket is a no-refunds no-changes one. Similarly, if your return Eurostar arrives late into London and you miss your onward connection, the UK train operator is obliged to let you take the next available train, even if you have a train-specific Advance ticket. I'm glad to say that Eurostar normally honour this in the event of a delayed UK connection even if you only have a regular UK ticket, but it's good to have the actual legal entitlement. Advantage 3: They include the Underground to St Pancras: If you arrive at one of the other London terminal stations and need the Underground to reach St Pancras, tickets to London International include the Underground. Although from Euston, it's easier to walk 5 minutes along the main road than to try and take the Underground for just one stop. Can you buy these fares online? You can buy these tickets for some routes at www.raileasy.com, but other routes no longer bring up any fares even when a check of fares to destination 'LNE' at www.brfares.com shows they exist. You used to be able to buy them at Loco2.com as well, by using London St Pancras International CIV as your origin or destination, but Loco2 were stopped from selling these fares separately by ATOC so they'll now only sell them as part of a through booking to or from Europe. ATOC have been worried about people without Eurostar tickets abusing them, until recently www.raileasy.com resisted ATOC's noises, Raileasy's problem with finding these fares on certain routes is probably a technical problem. As usual, we poor passengers have to stay one jump ahead of the rail industry's self-destructive determination to create products then make it impossible to buy them, then wonder why nobody buys them, then discontinue them. These days a product which is not available online is no product at all. The need to have a Eurostar ticket to use these fares is no different from having to have a railcard to buy a discounted ticket, it's a revenue protection problem, not a sales issue. Buy them in person at your local station. You must show your Eurostar ticket to qualify, with some train companies a booking printout is sufficient, but not always. The flexible Saver variety (but not the cheaper Advance type) can be bought on the day of travel if necessary as the price doesn't change, no advance reservation is necessary, and they are available in unlimited numbers. Ticket office staff aren't always 100% familiar with these London International fares, so if they feign ignorance, be prepared to be polite but firm and if they say they can't find it on their ticket machine say you want destination code "LNE". One reason for booking online in advance is to avoid arguments with train operator ticket office staff who deny the existence of these fares! If you want to check whether these special tickets exist from your own local station and what the time restrictions are: Go to www.brfares.com. Enter the name of your local station. Enter 'London' and select 'London International' from the list that appears (or type destination code LNE). If any fare appears in the results with the word 'EURO' in it (but without the letters ITX, that's a special rate for tour agencies) then you can indeed buy a special ticket to London International. If there are no restrictions shown, you can hop on any train. Green background = returns, orange background = one-ways. ...special tickets to London Eurostar CIV. A special set of fares exist between some 130+ UK towns & cities and a special destination called London Eurostar CIV. These are the special fares Eurostar adds to its own fares to sell its through tickets, and they are usually the cheapest way to add a UK train journey to your Eurostar booking. Fares to London Eurostar CIV are usually cheaper than the equivalent fare to London International CIV. Unfortunately you can no longer buy these fares separately, as Eurostar closed its domestic travel office at Ashford in July 2016. Until or unless someone agrees to make these fares available separately online, the only way to get them is as part of a through booking from 130 UK towns & cities to Paris, Lille or Brussels booked at www.eurostar.com. If you're going beyond Paris or Brussels you'll have to split your booking as necessary, and of course wait till UK train booking opens around 90 days ahead. Most annoying! You don't have to board Eurostar in London. Many Eurostars call at Ebbsfleet on the M25 and a few call at Ashford in Kent. Many Eurostars call at Ebbsfleet in Kent, near Gravesend and not far from the M25. There's plenty of car parking, around £11 a day. You can also travel to Ebbsfleet by train. South Eastern Trains operate high-speed domestic trains from Dover, Folkestone, Canterbury & Ashford to Ebbsfleet International, or you can take regular trains to Gravesend, then take the FastTrack bus link from Gravesend station to Ebbsfleet International (the bus is no longer free, a small fare is now charged). To see an access map of Ebbsfleet and see a list of station facilities, see www.eurostar.com, click 'Travel Information', then 'Eurostar terminals' then 'Ebbsfleet International'. Most sites allow you to book from Ebbsfleet. However, German Railways (bahn.de) don't, they only sell their sparpreis London tickets to Germany from London, but Eurostar have no problem with you buying a ticket from London and getting on at Ebbsfleet or Ashford instead. A handful of Eurostars call at Ashford International, which has good direct train connections from Brighton, Hastings, Canterbury, Maidstone, Dover. If you live in the north of England or Scotland, by all means buy a Eurostar through ticket or buy a ticket to London to connect with Eurostar. As Kings Cross and St Pancras stations are adjacent, and Euston only a short walk away, interchange is really easy between Eurostar and domestic UK trains arriving at Euston, Kings Cross or St Pancras. But depending on your final destination, also consider by-passing London & Eurostar, using an overnight cruise ferry direct from the North of England to mainland Europe. Newcastle-Amsterdam: An overnight cruise ferry run by DFDS Seaways sails daily from Newcastle at 17:00 (North Shields ferry terminal, arriving in Amsterdam (IJmuiden ferry terminal) at 09:30 next morning. Buses & taxis link IJmuiden with central Amsterdam. Allow at least 2 hours between your train arriving at Newcastle Central Station and the ferry sailing from Newcastle's International Ferry Terminal, a bus links Newcastle station with the terminal, journey time 30 minutes or so. Hull-Rotterdam & Hull-Zeebrugge: P&O ferries sail overnight from Hull to Rotterdam (for trains to Amsterdam or Brussels, see www.ns.nl for times & prices) & Zeebrugge (for trains to Brussels, see www.b-rail.be for times & prices). Use www.bahn.de to check train times to destinations further into Europe. Then use daytime trains to places such as Berlin or Basel, arriving in the evening. Simply use www.bahn.de to find train times, allowing plenty of time for connections, then book those trains by calling DB's UK office on 08718 80 80 66, lines open 09:00-20:00 Monday-Friday, 09:00-13:00 weekends. Travelling from the West of England or South Coast? If you live in the West Country or along the South Coast, by all means buy a Eurostar through ticket or buy a ticket to London to connect with Eurostar. But also consider a ferry crossing direct to France then a train to Paris. Once in Paris you can pick up the trains to Italy, Switzerland or Spain shown on the relevant country pages of this site. For example, taking the 23:45 overnight Brittany Ferries ship from Portsmouth to Caen with a comfortable cabin reserved arriving 07:30, then taking the 09:24 train from Caen to Paris arriving 11:11, works well to catch an afternoon train to the South of France or Switzerland, or even the overnight sleepers to Italy or Spain. 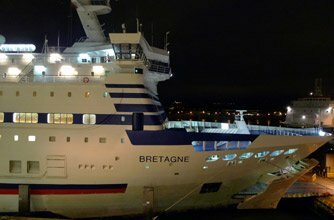 The 22:00 overnight ferry from Plymouth arrives Roscoff 08:00, a train from Roscoff will get you to Paris by around 16:10-18:20. To check train times & fares from any of these French ports to Paris (and to book online) use either www.loco2.com or www.trainline.eu. Once in Paris you can pick up the trains to the South of France, Spain, Italy & Switzerland recommended on the other country pages of this site. Remember to allow plenty of time (90 minutes+) for interchange between ferry and railway station at the French port. Train + ferry options from London & Dover to Calais & Paris are shown on the London to Paris by train+ferry page. Don't forget that Brittany Ferries sail up to 5 times each week direct from Plymouth & Portsmouth to Santander & Bilbao in northern Spain, see the Spain by ferry page. It's a superb way to get there. If you live in East Anglia, you can buy a cheap combined train+ferry ticket from any Greater Anglia rail station (for example, Cambridge, Ipswich, Norwich, Bury St Edmunds or even London) to any station in the Netherlands (for example, Amsterdam or Utrecht) via Stena Line's Harwich-Hoek van Holland superferries. Fares are great value, around £49 each way using the daytime ferry or £79 each way using the overnight ferry including a private en suite cabin. See the UK to the Netherlands page for details. There are daytime trains from the Netherlands to places such as Berlin or Basel, arriving in the evening. Use www.bahn.de to find train times from Hoek van Holland, allowing plenty of time for connections, then book the trains by calling DB's UK office on 08718 80 80 66, lines open 0900-1700 Monday-Friday.